Classified a third growth in 1855, Château Ferrière was leased by Alexis Lichine to Chateau Lascombes in 1951. 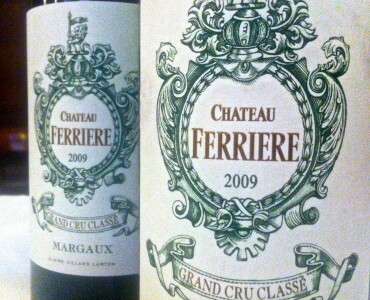 In 1992 the Ferrière was purchased by Merlaut-Villars family and Claire Villars-Lurton has done much as director/administrator to bring the estate back on track, though the estate is tiny and remains somewhat obscure. Fine Margaux wine, a bit more high-toned Cabernet dominated in style. 2009 looks very good here. Second wine Les Remparts de Ferrière. Vineyard/Soil: 8 hectares on deep gravel with 80% Cabernet Sauvignon and 15% Merlot and 5% Petit Verdot on average 35 years old. Harvested by hand. Winemaking/Elevage: Vinification in stainless steel with temperature control and 20 day maceration. Malolactic fermentation in barrel and aged for 16 to 20 months in oak, in 60% new oak. Egg white fining.